welcome back to college meal chronicles! fast, easy food with only a few ingredients. tasty as always. and of course, you don’t need to be in college to make these. are you obsessed with dolsot bibimbap (the korean dish with crispy rice, sesame-flavored veggies and toppings, and spicy/sweet gochujang sauce)? or arancini, the italian balls of crispy rice on the outside, creamy risotto on the inside? here’s more crispy rice for you, then. you’re welcome. hot rice is key; otherwise it won’t work and it won’t stick to the other grains. my first attempt was with cold leftover rice and that was a mess. i ended up making fried rice with it. and then, i used hot rice; the musubi angels sang, and IT WAS SO EASY and mine even looked vaguely triangular. whoohooo. the rest of my notes are in the instructions and they’re more for people who need and crave direction (this is me for unfamiliar things: mochi ice cream, anything to do with raw meat besides dumping it in the pan and cooking it, etc, though i’m trying to be more independent).be patient and don’t touch it. i mean it. i’m one of those people who always wants to check and touch and make it be DONE already, but control yourself. i did some dishes and got an egg out. it sort of helped. and then i topped it with a fried egg for protein. if, at this point, you’ve used up all your patience and want crispy rice bits now, that’s fine! i got you. make it sunnyside up or fry it over a hot skillet and you get a cooked egg in a minute. even less if you’re okay with runny eggs! they make me queasy normally, but if they’re with crispy rice (ie here or dolsot bibimbap one of the most fabulous rice dishes alive thank you korea for all your amazing food), i’m down. 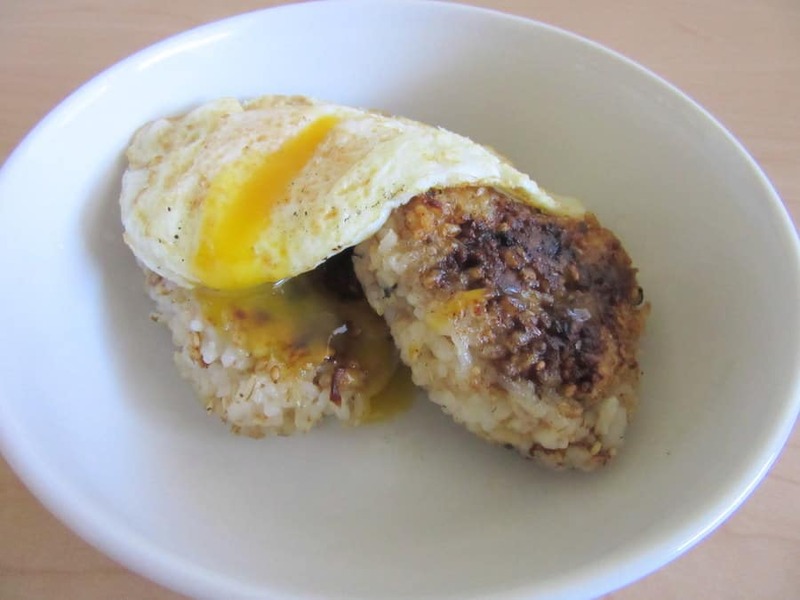 slide the egg on top of the musubi and serve. i drizzled mine with a bit of sesame oil, and if you want, more furikake (i noticed that the flavor of the furikake was a lot more subtle once it was cooked). and if you did it right (if you had enough patience to cook it and then impatience to devour), you’ll have crispy rice that’s crackly and crunchy but not hard, with some tender rice in the middle. a little sweet and briny from the furikake (mine had seaweed, bonito, sesame and a touch of sugar), with the savoriness of the soy. the egg yolk drips down into the rice crevices and make it creamy and a little gooey (okay i’m not 100% into runny eggs with crispy rice but definitely 87% there). it’s perfect for anytime and anything; for breakfast topped with a fried egg, for lunch stuffed with sesame oil-slicked spinach, or for dinner with cooked salmon or chicken in the middle. and i bet you could form them ahead of time whenever you make rice, and then leave them in the fridge for when your next musubi cravings hits. then you can have them whenever you want!! excuse me while i go make another pot of rice. Mix the shoyu and mirin. If you are making different kinds, take out about half the rice in a bowl. Mix in furikake to taste and shape into rounded triangular musubi. Make sure the face is as flat as possible. Heat a nonstick pan with a bit of oil. Use a brush to coat one side of the musubi with glaze (I didn’t have a brush, so I just drizzled it on top). Put glazed side down on the pan (it should sizzle when the rice touches the pan) and glaze the other side. Cook until caramelized and crunchy; it’ll stop sizzling so ferociously, and the side you just cooked will have a hard crust when you tap it, and it’ll be golden brown (mine looked burnt and really dark in the middle, because the soy sauce was so dark; the edges were nicely tanned though). Flip and cook the other side. Yay for crispy fried things! This reminds me of the crispy bottom of Persian rice – except now I can make it bite sized! Perfect! Yes to yaki onigiri! I took Japanese lessons growing up and onigiri is such a comfort food in my kitchen. Though I always make onigiri with wet, salted hands; was that not necessary with your rice because of the furikake? whoa that sounds so cool to take japanese lessons growing up! and rice in general is very comforting to me. hmm, to be honest, i can’t remember if i use wet hands or not (i used to make these a lot last year, haven’t made them much this year; also currently having a brain fart). but i do use wet hands when i make spam musubi, so i’m assuming i do for these too (and have updated the post accordingly! ).